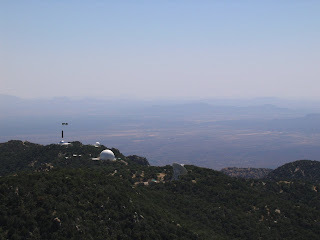 MDM is located on the southwestern ridge of Kitt Peak and is a little removed from the telescopes owned by NOAO. The pointer shows which telescope we're using. It's a 2.4m telescope, which means that the primary mirror has a diameter of 2.4 meters. Kitt Peak was built on Native American land. As such, the administration for the site has to take much care to keep relations pleasant between the astronomical community and these native americans. There are many education/public outreach programs that specifically target the native american population. All this to say, the mountain seen in the background in this picture is what the Tohono O'odham have traditionally believed is the center of the universe. Maybe we've changed a few minds about this. The dome in the foreground of the picture houses the telescope that I'm using. As you can see, the background shows the top of the mountain where most of the telescopes are located. I don't know why, but I really like the landscape in AZ. I think it comes from my love of cacti. :) This is just a nice view from the mountain.